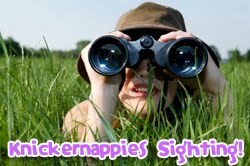 In our Knickernappies Sightings post we give you the details on where you can find Knickernappies sales, giveaways, reviews, blog posts and more on the web. This week we're focusing on the open giveaways that are recently popping up! Visit Abby's Lane - Top cloth diaper retail store, Abby's Lane, is hosting a giveaway on their blog Cloth that Counts for a One-size Diaper, 2 Micro Inserts and 1 Super Do Insert. Mandatory entry is to leave a comment with your experience with Knickernappies products, what you love about them or what you'd like to try. Visit The Not-So-Secret Confessions of a Second Time Mom - Cloth diaper blogger and mommy of two, Michelle, reviewed one of our One-size Pocket Diapers. Sponsored by one of our fabulous retailers, Irresistibly Green, Michelle is giving away a One-size Pocket Diaper along with a bunch of other awesome prizes. To read her review on our diaper please visit here! No mandatory entry.